Jordan Eagles, UR23, 2008, blood, copper, Plexiglas, UV resin, 20 x 20 x 3”. Within the quiet space of the gallery, the assuredly violent, loud, and chaotic environment from which the blood was originally collected is contrasted by a seductive quality that emerges from the artist’s large-scale works: the arrest of the flow of blood through its preservation in Plexiglas and UV resin panels. UR23, 2008, for example, consists of heated blood that has formed layers of bursting gradations of the sanguine color. 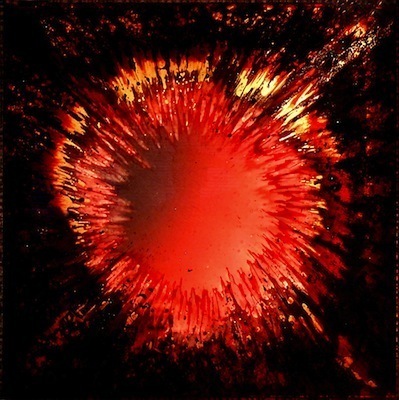 Similarly, BDLF1, 2012, depicts an explosion created by the patterns in the panel, where blood dust and copper amplify the biological matter in varying hues. These abstract crimson shapes point to organs, perhaps dead, perhaps barely alive, as well as to the astronomic phenomenon that once determined our existence and might embody future rebirth, such as through meteorites and supernova. Though frozen, these works are continually in the midst of battle. In another room, the installation Blood Illuminations, 2013, envelops the visitor in an analog projection of magnified red blood cells, which covers each wall. These visceral experiences, as well as the turn to Minimalist practices, may echo artistic responses to the emergence of the AIDS crisis in the late twentieth century. Removed from a pandemic sense of urgency, the bloody panels navigate temporal tensions, corporal demise, and the imagined possibility of regenerating life.